Today, many families have hectic schedules with parents and kids balancing work, school, after school activities and other important functions that occur throughout the week. These are all high-stress situations that can take away from everyone’s well-being. However, families can still focus on fun-filled activities that the entire family can enjoy and do together. Here is a short list of activities you can rely on when you want to unwind with your kids and enjoy some quality time as a family. One of the best ways to reduce stress is to head outdoors and get some fresh air. 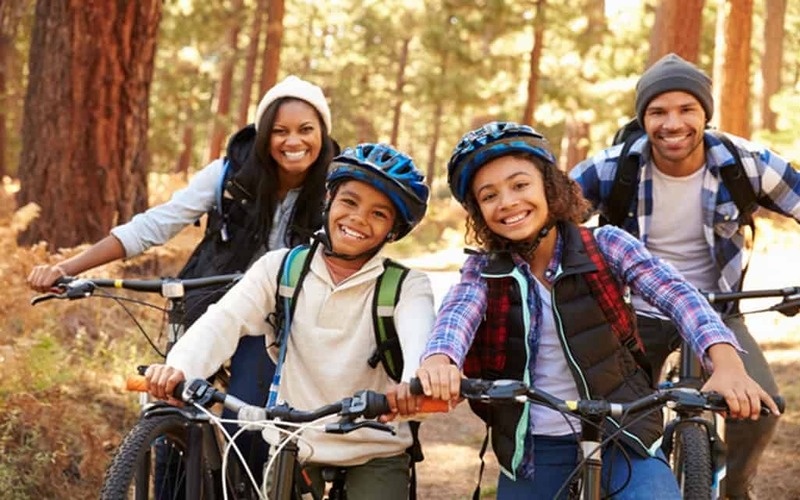 The entire family can take a trip outside and enjoy activities including taking nature walks, jogging, bike riding, exercising or practicing calming yoga. Outdoors activities are important for a few reasons. First, they are great for physical fitness. Not only can being outside help the family stay in shape, but the brain is wired to make you feel better afterwards. This is because active physical movement produce endorphin, a stress-reducing hormone. Therefore, regular outdoors activities can stabilize the entire family’s mood and well-being, making everyone feel much better and relaxed after they return home. Baking sweet treats in the kitchen is another stress-reducing activity the entire family can do together. Making cookies, cakes, pies and other desserts is a great way to get the kids excited (and adults too)! Have children measure ingredients, mix items and time them after they have been placed in the oven. Baking is a comforting activity that creates sweet aromas in the kitchen as you anticipate eating the delicious items you are making. What’s more is that baking can bring back feelings of nostalgia and is an amazing way to create new memories as the entire family partakes in an activity everyone can appreciate. Alleviate stress and anxiety through family meditation. Mediation is a way to clear your find, focus your energy and concentrate on the present moment. Everyone in the family can practice mediation and get in touch with their inner selves and release negative energy. There are many options to choose from when it comes to meditation. For instance, there are fun guided meditations that have helpful mantras or there are meditations that are accompanied by music. There are also anxiety-relieving crystal meditations where the healing energy of precious stones are used to release the family’s worry and tension. No matter your choice, choose a comfortable space within the home where everyone can sit still together and relish in the peacefulness of quiet time together. One of the joys in life is the gift of giving. What better way to spend time with your family than helping out others and making the world a better place. Teaching your kids to contribute to their community, will make them more empathetic around others and grow to be happy adults. Helping the people around you may just be the secret to living a life that is not only happier but also healthier and meaningful. As a family you will grow stronger and always feel you can rely on one another. Last but not least, consider other fun activities that can fill the home with laughter and love. These can range from having family dance offs where moms and dads bust a move, hosting a family game night with fun snacks and refreshments, or simply telling funny and engaging stories that the entire household can share in and laughter together. So even though stress is an inevitable part of life, it can certainly be mitigated. Healthy living is all about maintaining a lifestyle that is enjoyable and meaningful for the entire family. Try any of these great, stress relieving activities to keep your family’s well-being on track, bringing a sense of balance and joy back into the home.